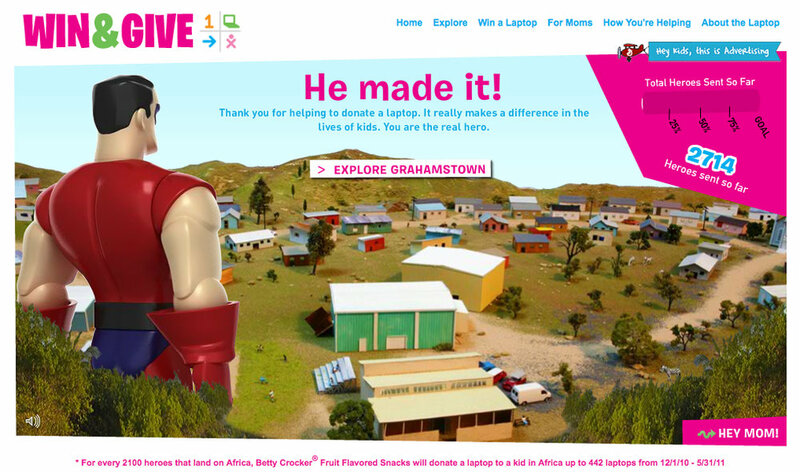 When a company like General Mills plans a massive promotion to give away thousands of laptops to both contest winners and underprivileged schoolchildren in Africa, they hire a top-notch ad agency like Saatchi & Saatchi. Working with Publicis, who S&S hired to help produce this campaign, we designed the character that serves as the lynch-pin of the entire campaign. Bigshot Toyworks was contracted to develop, design, and produce the physical & digital assets for this heroic character. Engineered digital files were sent to Africa for on-site prototype production and painting to meet an incredibly tight production deadline. Digital assets were also created for use in the online Flash game for the "Win One Give One" website. From the initial phone call to the finished product, this character came to life in just under 2 weeks. While we generally prefer a bit more time for such high-profile projects, we can always be counted on to deliver.